It's Valentine's Day, which is great time snuggle up with a partner if you're with someone, or an extra-large pizza if you're not, but what if your status falls somewhere in between? 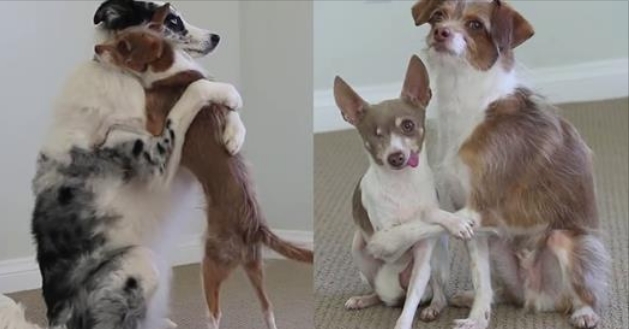 Fortunately, the pups at San Diego's Dogmantics training school have you covered, offering examples of five different hug techniques for this heart-filled holiday, at least one of which should work for your current situation. NOTE: Valentine's Day, also called Saint Valentine's Day or the Feast of Saint Valentine, is an annual holiday celebrated on February 14. The U.S. Greeting Card Association estimates that approximately 190 million valentines are sent each year in the US. Half of those valentines are given to family members other than husband or wife, usually to children. When the valentine-exchange cards made in school activities are included the figure goes up to 1 billion, and teachers become the people receiving the most valentines. Responses to "Adoring Dogs Teach You The Perfect Hug "